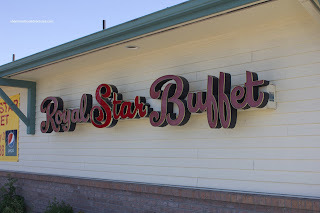 Awhile back on my way down to Seattle, I noticed that the Royal Fork Buffet in Mt. Vernon had shut down. Not that it was surprising though. 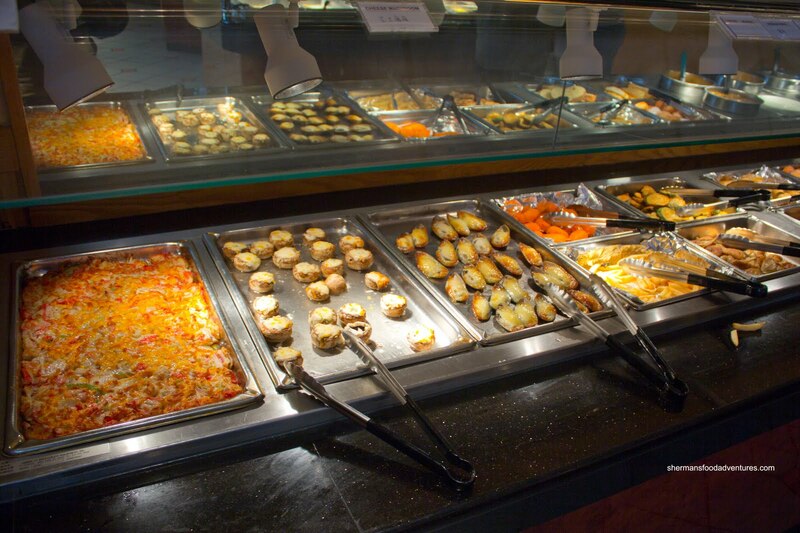 The food was distinctly below-average (even for a buffet) and the selection was pretty boring. Still, there was a part of me that was lost forever with the closure. Royal Fork was part of my childhood. We'd head down to the Bellingham location (long gone) for the good ol' American buffet on our shopping trips. Now with the Mt. Vernon location gone, there are no more physical reminders of times past. Then all of a sudden, the place was open again. Driving back from SeaTac, we noticed it was no w Royal Star Buffet. Well, I guess that was a cost-saving name change with only the fork becoming a star. Now, the name change was not the only thing different about the place. Apparently, the place is now Asian-run and is reflected in the food. 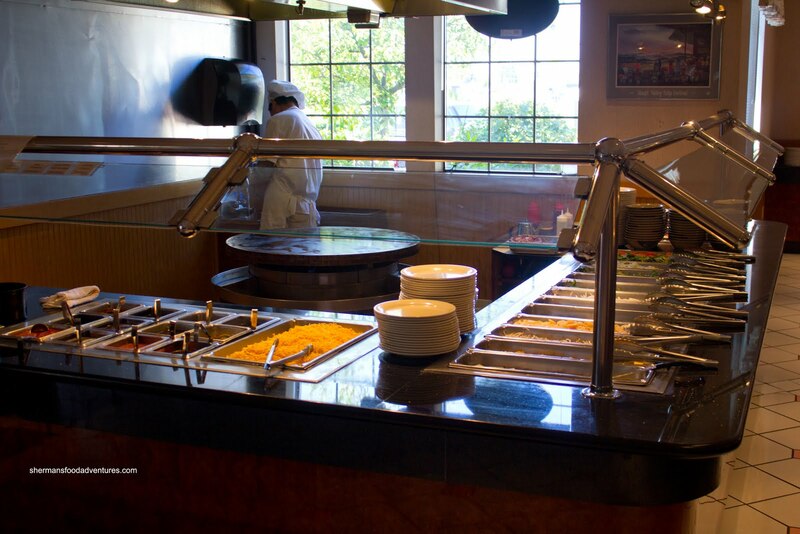 The most major renovation to the inside of the restaurant has been the addition of a Mongolian grill. Otherwise, it looks exactly the way it did before. Now you might be wondering why I returned here in the first place. After all, buffets are never really the best places to find great food. Well, this is exactly what happened... We were at The Outlets and our stomachs were growling. I suggested the Mexican taqueria which was met with indifference. Then we drove by countless chain restaurants such as Applebees, Red Robin and Olive Garden, which did not interest us in any way. Then, I threw the idea of Royal Star out and Viv was like, "you want to go there???". When I mentioned that lunch was only $7.69, she reluctantly agreed. 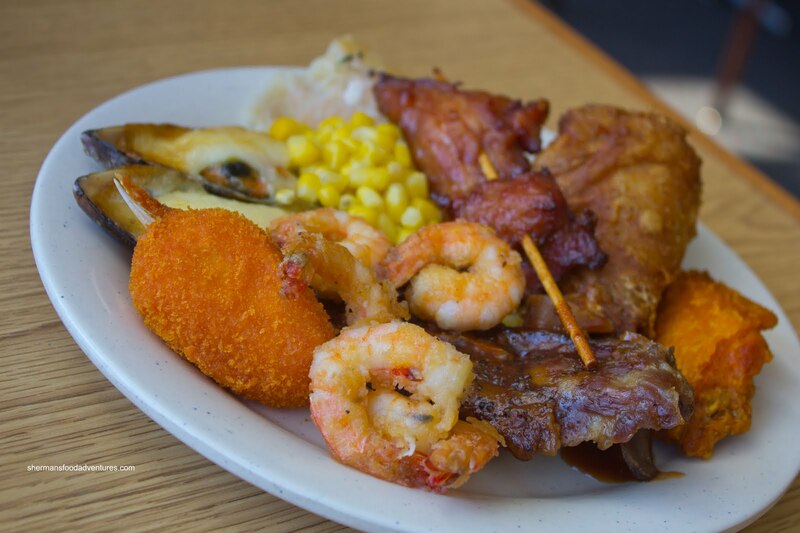 For the price of a supersized McD's meal or a foot long at Subway, we got variety. Oh and was there a lot of different items to choose from. Let me start listing some of the available items and bear with me, it's a lot... 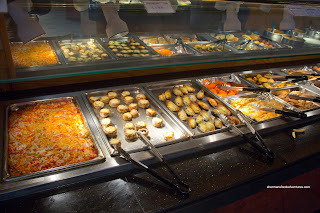 Starting with the first picture from the left, there was Cheese and Imitation Crab Casserole, Cheese-Stuffed Mushrooms, Mussels Motoyaki, Stuffed Crab Claws, Fries, Fried Zucchini, Potstickers, Spring Rolls, Garlic Bread, Fried Mantou and Pizza Bread. Of these, I totally avoided the casserole. As for the mushrooms, they were okay while the mussels were salty and the sauce was far too eggy. The crab claws were completely laughable since they were very tiny claws stuffed with fish mousse. There were 5 different soups right next to this station consisting of Hot & Sour, Egg Drop, Wonton, Clam Chowder and Chicken Noodle. I only gave 2 of them a try since the egg drop had an unnatural-looking yellow hue to it and the wonton soup looked downright scary with its monstrous dumplings. The hot & sour soup was actually hot and sour, however, it had no depth whatsoever. Surprisingly, the white clam chowder was pretty good. It was full of clams and potato while being sufficiently creamy. 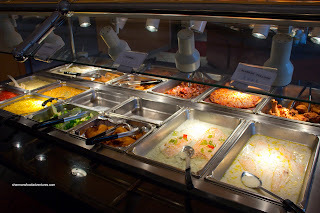 Directly across was another station with Poached Pollack and Salmon, Fried Fish, Broccoli, Corn, Spaghetti with Meat Sauce, Mashed Potatoes, Biscuits, Fried Wedges, Riblets, Pizza and Fried Chicken. Most things were forgettable here other than the 2 meats. The riblets reminded me of the ones served at Applebees except the BBQ sauce was a tad bland. The large pieces of fried chicken were pretty good. The meat was moist while the skin was nice and crispy. 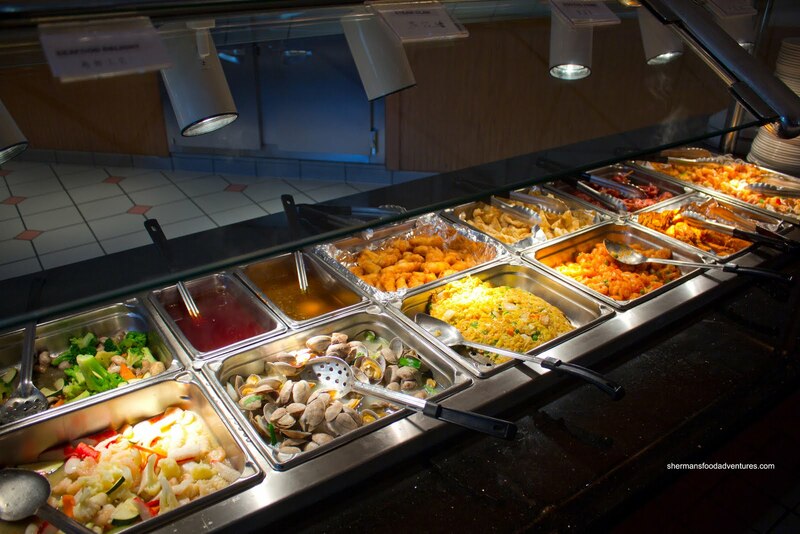 Moving along to the next station was Stir-Fried Cauliflower with Seafood, Steamed Clams, Egg Foo Yeung, Chili Shrimp, Chili Salt Shrimp, Chicken Yakitori, Fried Wontons, Fried Chicken with either lemon or sweet 'n sour sauce and Stir-Fried Veggies. The highlights here were the clams (which were a bit overcooked, but still decent) and the chili salt shrimp (they were small, yet had lots of flavour). 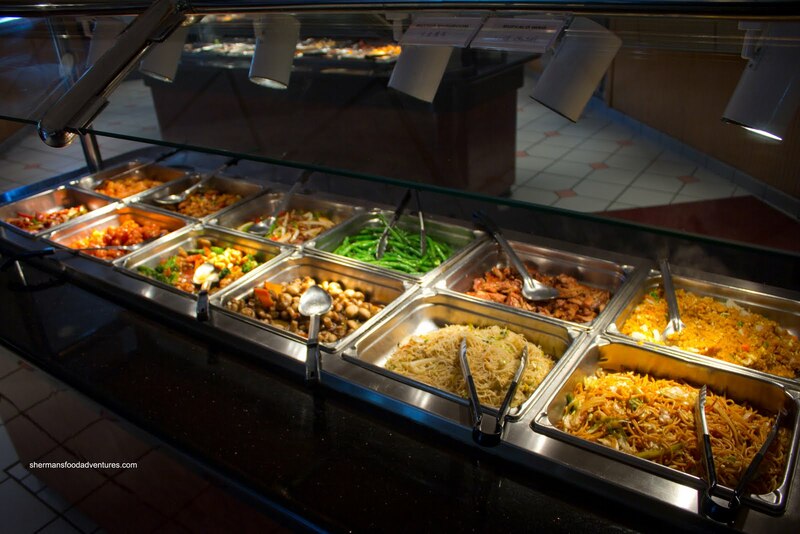 Onto yet another section was the Chow Mein, Fried Vermicelli, Sauteed Mushrooms, Mongolian Beef, Sweet 'n Sour Meatballs, General Tso's Chicken, Green Beans, BBQ Pork and Fried Rice. The best way to describe this section - move along, nothing to see or eat here. The food was surprisingly bland despite its appearance. The fried rice was soggy while the noodles almost seemed to be unseasoned. The last row consisted of salads and Peel 'n Eat Shrimp which were actually quite good. They were properly cooked with a nice snap. Personally, the best section of all was the Mongolian Grill where you can pick your meats, veggies, noodles and sauces. 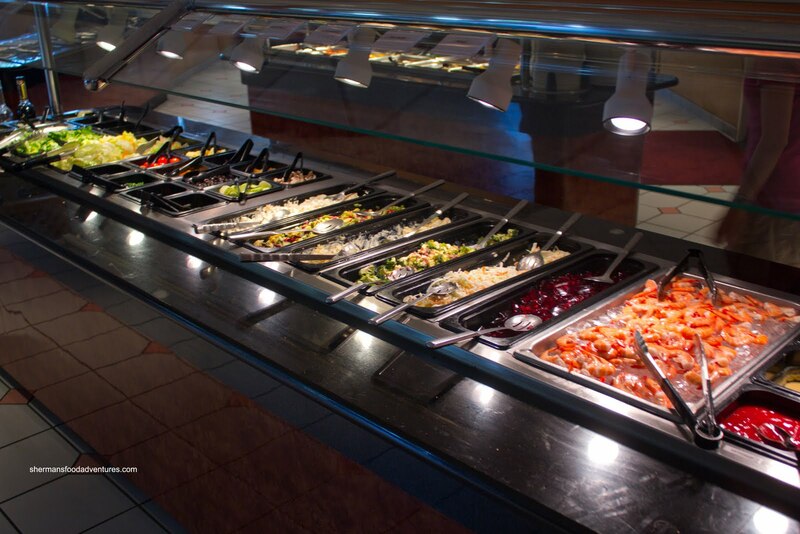 The chef cooks it to order and it suddenly becomes the freshest item in the buffet. 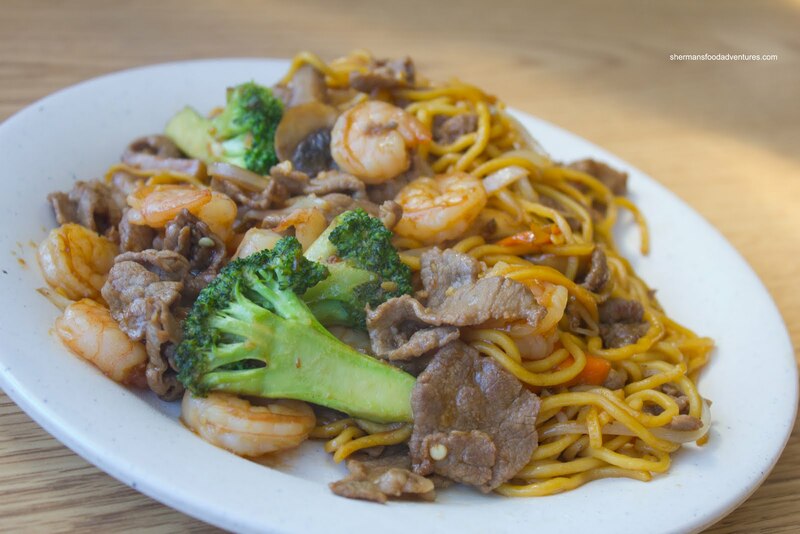 In fact, if I ever were to return, I'd just hit up the Mongolian grill for $7.69. That would be worth it in itself. Lastly, the dessert station was pretty much the same as before in terms of location and unappetizing appearance. These were essentially "courtesy" items since they only existed for the purpose of being. None looked particularly good and I didn't even feel it warranted a picture here. However, I'm going to be reasonable. The price is dirt cheap and if you stick to the stuff that is okay, you'll be satisfied. Yet, if you really want to try everything... Well, it might leave a bad taste in your mouth - literally.